Maximilian II (31 July 1527 – 12 October 1576), a member of the Austrian House of Habsburg, was Holy Roman Emperor from 1564 until his death. He was crowned King of Bohemia in Prague on 14 May 1562 and elected King of Germany (King of the Romans) on 24 November 1562. On 8 September 1563 he was crowned King of Hungary and Croatia in the Hungarian capital Pressburg (Pozsony in Hungarian; now Bratislava, Slovakia). On 25 July 1564 he succeeded his father Ferdinand I as ruler of the Holy Roman Empire. Maximilian's rule was shaped by the confessionalization process after the 1555 Peace of Augsburg. Though a Habsburg and a Catholic, he approached the Lutheran Imperial estates with a view to overcome the denominational schism, which ultimately failed. He also was faced with the ongoing Ottoman–Habsburg wars and rising conflicts with his Habsburg Spain cousins. According to Fichtner, he failed to achieve his three major aims: rationalizing the government structure, unifying Christianity, and evicting the Turks from Hungary. Born in Vienna, Austria, he was the eldest son of the Habsburg archduke Ferdinand I, younger brother of Emperor Charles V, Holy Roman Emperor, and the Jagiellonian princess Anne of Bohemia and Hungary (1503–1547). He was named after his great-grandfather, Emperor Maximilian I. At the time of his birth, his father Ferdinand succeeded his brother-in-law King Louis II in the Kingdom of Bohemia and the Kingdom of Hungary, laying the grounds for the global Habsburg Monarchy. Having spent his childhood years at his fathers's court in Innsbruck, Tyrol, he was educated principally in Italy. Among his teachers were humanist scholars like Kaspar Ursinus Velius and Georg Tannstetter. 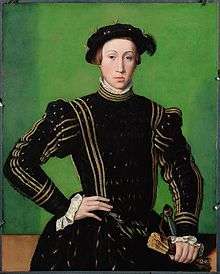 Maximilian also came in contact with the Lutheran teaching and early on corresponded with the Protestant prince Augustus of Saxony, suspiciously eyed by his Habsburg relatives. From the age of 17, he gained some experience of warfare during the Italian War campaign of his uncle Charles V against King Francis I of France in 1544, and also during the Schmalkaldic War. Upon Charles' victory in the 1547 Battle of Mühlberg, Maximilian put in a good word for the Schmalkaldic leaders Elector John Frederick I of Saxony and Landgrave Philip I, Landgrave of Hesse, and soon began to take part in Imperial business. On 13 September 1548 Emperor Charles V married Maximilian to Charles's daughter (Maximilian's cousin) Mary of Spain in the Castile residence of Valladolid. 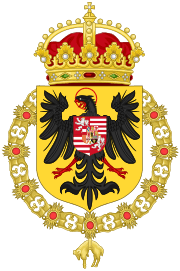 By the marriage his uncle intended to strengthen the ties with the Spanish branch of the Habsburgs, but also to consolidate his nephew's Catholic faith. Maximilian temporarily acted as the emperor's representative in Spain, however not as stadtholder of the Habsburg Netherlands as he had hoped for. To his indignation, King Ferdinand appointed his younger brother Ferdinand II administrator in the Kingdom of Bohemia, nevertheless Maximilian's right of succession as the future king was recognised in 1549. He returned to Germany in December 1550 in order to take part in the discussion over the Imperial succession. Maximilian's relations with his uncle worsened, as Charles V, again embattled by rebellious Protestant princes led by Elector Maurice of Saxony, wished his son Philip II of Spain to succeed him as emperor. However, Charles' brother Ferdinand, who had already been designated as the next occupant of the imperial throne, and his son Maximilian objected to this proposal. 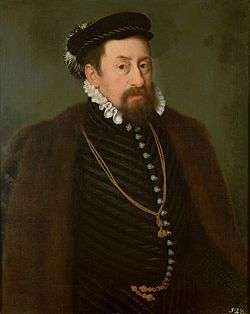 Maximilian sought the support of the German princes such as Duke Albert V of Bavaria and even contacted Protestant leaders like Maurice of Saxony and Duke Christoph of Württemberg. At length a compromise was reached: Philip was to succeed Ferdinand, but during the former's reign Maximilian, as King of the Romans, was to govern Germany. This arrangement was not carried out, and is only important because the insistence of the emperor seriously disturbed the harmonious relations which had hitherto existed between the two branches of the Habsburg family; an illness which befell Maximilian in 1552 was attributed to poison given to him in the interests of his cousin and brother-in-law, Philip II of Spain. The relationship between the two cousins was uneasy. While Philip had been raised a Spaniard and barely travelled out of the kingdom during his life, Maximilian identified himself as the quintessential German prince and often displayed a strong dislike of Spaniards, whom he considered as intolerant and arrogant. While his cousin was reserved and shy, Maximilian was outgoing and charismatic. His adherence to humanism and religious tolerance put him at odds with Philip who was more committed to the defence of the Catholic faith. Also, he was considered a promising commander, while Philip disliked war and only once did he personally command an army. Nonetheless, the two remained committed to the unity of their dynasty. 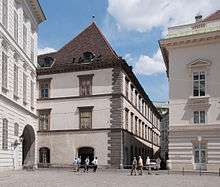 In 1551 Maximilian attended the Council of Trent and the next year took up his residence at Hofburg Palace in Vienna, celebrated by a triumphal return into the city with a large entourage including the elephant Suleiman. While his father Ferdinand concluded the 1552 Treaty of Passau with the Protestant estates and finally reached the Peace of Augsburg in 1555, Maximilian was engaged mainly in the government of the Austrian hereditary lands and in defending them against Ottoman incursions. In Vienna, he had his Hofburg residence extended with the Renaissance Stallburg wing, the site of the later Spanish Riding School, and also ordered the construction of Neugebäude Palace in Simmering. The court held close ties to the University of Vienna and employed scholars like the botanist Carolus Clusius and the diplomat Ogier Ghiselin de Busbecq. Maximilian's library curated by Hugo Blotius later became the nucleus of the Austrian National Library. He implemented the Roman School of composition with his court orchestra, however, his plans to win Giovanni Pierluigi da Palestrina as Kapellmeister foundered on financial reasons. In the 1550s, Vienna had more than 50,000 inhabitants, making it the largest city in Central Europe with Prague and before Nuremberg (40,000 inhabitants). The religious views of the future King of Bohemia had always been somewhat uncertain, and he had probably learned something of Lutheranism in his youth; but his amicable relations with several Protestant princes, which began about the time of the discussion over the succession, were probably due more to political than to religious considerations. However, in Vienna he became very intimate with Sebastian Pfauser, a court preacher influenced by Heinrich Bullinger with strong leanings towards Lutheranism, and his religious attitude caused some uneasiness to his father. Fears were freely expressed that he would definitely leave the Catholic Church, and when his father Ferdinand became emperor in 1558 he was prepared to assure Pope Paul IV that his son should not succeed him if he took this step. Eventually Maximilian remained nominally an adherent of the older faith, although his views were tinged with Lutheranism until the end of his life. After several refusals he consented in 1560 to the banishment of Pfauser, and began again to attend the Masses of the Catholic Church. In November 1562 Maximilian was chosen King of the Romans, or German king, by the electoral college at Frankfurt, where he was crowned a few days later, after assuring the Catholic electors of his fidelity to their faith, and promising the Protestant electors that he would publicly accept the confession of Augsburg when he became emperor. He also took the usual oath to protect the Church, and his election was afterwards confirmed by the papacy. He was the first King of the Romans not to be crowned in Aachen. In September 1563 he was crowned King of Hungary by the Archbishop of Esztergom, Nicolaus Olahus, and on his father's death, in July 1564, he succeeded to the empire and to the kingdoms of Hungary, Croatia and Bohemia. Meanwhile, the relations between Maximilian and Philip of Spain had improved; and the emperor's increasingly cautious and moderate attitude in religious matters was doubtless because the death of Philip's son, Don Carlos, had opened the way for the succession of Maximilian, or of one of his sons, to the Spanish throne. Evidence of this friendly feeling was given in 1570, when the emperor's daughter, Anna, became the fourth wife of Philip; but Maximilian was unable to moderate the harsh proceedings of the Spanish king against the revolting inhabitants of the Netherlands. In 1570 the emperor met the diet of Speyer and asked for aid to place his eastern borders in a state of defence, and also for power to repress the disorder caused by troops in the service of foreign powers passing through Germany. He proposed that his consent should be necessary before any soldiers for foreign service were recruited in the empire; but the estates were unwilling to strengthen the imperial authority, the Protestant princes regarded the suggestion as an attempt to prevent them from assisting their co-religionists in France and the Netherlands, and nothing was done in this direction, although some assistance was voted for the defense of Austria. The religious demands of the Protestants were still unsatisfied, while the policy of toleration had failed to give peace to Austria. Maximilian's power was very limited; it was inability rather than unwillingness that prevented him from yielding to the entreaties of Pope Pius V to join in an attack on the Turks both before and after the victory of Lepanto in 1571; and he remained inert while the authority of the empire in north-eastern Europe was threatened. In 1575, Maximilian was elected by the part of Polish and Lithuanian magnates to be the King of Poland in opposition to Stephan IV Bathory, but he did not manage to become widely accepted there and was forced to leave Poland. Maximilian's policies of religious neutrality and peace in the Empire afforded its Roman Catholics and Protestants a breathing-space after the first struggles of the Reformation. His reign also saw the high point of Protestantism in Austria and Bohemia and unlike his successors, Maximilian did not try to suppress it. He disappointed the German Protestant princes by his refusal to invest Lutheran administrators of prince-bishoprics with their imperial fiefs. Yet on a personal basis he granted freedom of worship to the Protestant nobility and worked for reform in the Roman Catholic Church, including the right of priests to marry. This failed because of Spanish opposition. Maximilian II was a member of the Order of the Golden Fleece. Archduchess Anna of Austria (1 November 1549 – 26 October 1580). Married Philip II of Spain, her uncle. She was the mother of Philip III of Spain. Archduke Ferdinand of Austria (28 March 1551 – 25 June 1552). Rudolf II, Holy Roman Emperor (18 July 1552 – 20 January 1612). Archduke Ernest of Austria, (15 July 1553 – 12 February 1595). He served as Governor of the Low Countries. Archduchess Elisabeth of Austria (5 July 1554 – 22 January 1592). Married Charles IX of France. Archduchess Marie of Austria (27 July 1555 – 25 June 1556). Matthias, Holy Roman Emperor (24 February 1557 – 20 March 1619). A stillborn son (20 October 1557). Archduke Maximilian of Austria (12 October 1558 – 2 November 1618). Elected king of Poland, but never crowned. 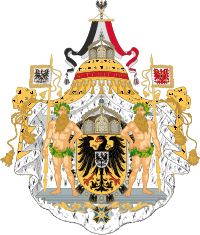 He served as grandmaster of the Teutonic Order and Administrator of Prussia. Archduke Albert of Austria (15 November 1559 – 13 July 1621). He served as Governor of the Low Countries. Archduke Wenceslaus of Austria (9 March 1561 – 22 September 1578). Archduke Frederick of Austria (21 June 1562 – 16 January 1563). Archduchess Marie of Austria (19 February 1564 – 26 March 1564). Named after her deceased older sister. Archduke Charles of Austria (26 September 1565 – 23 May 1566). Archduchess Margaret of Austria (25 January 1567 – 5 July 1633). A nun. Archduchess Eleanor of Austria (4 November 1568 – 12 March 1580). 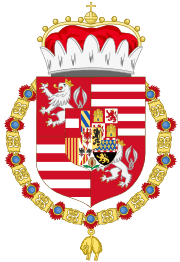 Maximilian II, by the grace of God elected Holy Roman Emperor, forever August, King in Germany, of Hungary, Bohemia, Dalmatia, Croatia, Slavonia, etc. 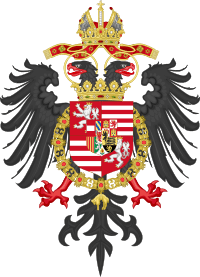 Archduke of Austria, Duke of Burgundy, Brabant, Styria, Carinthia, Carniola, Luxemburg, Württemberg, the Upper and Lower Silesia, Prince of Swabia, Margrave of the Holy Roman Empire, Burgau, Moravia, the Upper and Lower Lusatia, Princely Count of Habsburg, Tyrol, Ferrette, Kyburg, Gorizia, Landgrave of Alsace, Lord of the Wendish March, Pordenone and Salins, etc. etc. Wikimedia Commons has media related to Maximilian II, Holy Roman Emperor.